LONDON--(BUSINESS WIRE)--According to the market research report released by Technavio, the global automotive premium audio system market is expected to post a CAGR of nearly 6% during the forecast period. However, the growth momentum of the market is expected to decelerate due to a decline in the year-over-year growth. This research report titled ‘Global Automotive Premium Audio System Market 2018-2022’ provides an in-depth analysis of the market in terms of revenue and emerging market trends. It also includes an up-to-date analysis and forecasts for various market segments and all geographical regions. In 2017, the luxury cars segment accounted for 51% of the global market and is projected to decline to 42% by 2022, exhibiting almost 9% decrease in market share. 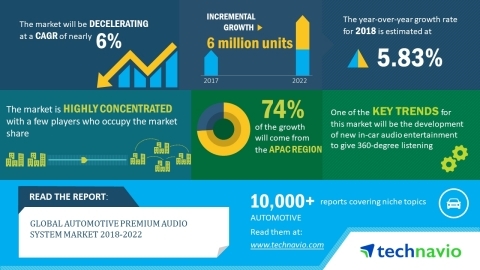 According to the research report by Technavio, the global automotive premium audio system market is expected to post a CAGR of nearly 6% until 2022.